The World's Largest Offshore Wind Farm went online on Thursday (9/17), thanks to the Denmark government. It is actually the first of its kind where maintenance personnel can spend the night. It all started back in 2000 when an Environmental Impact Assessment (EIA) summary report was completed. The hypothesis was to start with 80 turbines placed in a grid pattern with a goal of covering 12-14% of the country's energy consumption. This does not include the 1% annual increase they hoped to target as well. Today that dream is now true! 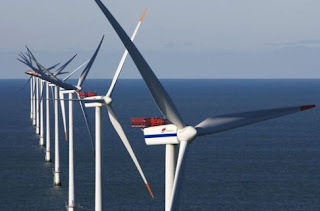 The offshore wind farm is located in the North Sea about 30km off the west coast of Jutland. It is also known as Horns Rev 2. This spot hosts 91 turbines, generates 209 megawatts of energy, which is enough to support 200,000 homes. This project covers 20% of their total power supply and Denmark is determined to be the World Champion of wind power.